In a recent facebook post I read, a young man working as a teacher of young children in China bemoaned his ineptness. He said, 'There really is no curriculum. I don't know what to teach!" I struggled to write an answer to his request for help, and then realized he needs only one central skill: observation. That assumes he has opportunities to observe the children's natural behavior in play, which requires play materials--natural materials or toys, or both. It's like that with our companion animals. Observing behavior, we gather data, adjust the environment, and observe some more. Here are examples from Bob-the-cat and his friends. When Bob first strayed to my home, to stay, he was fascinated with water. I wondered if he had been very thirsty at some point in his life, possibly when he was wandering looking for a home. If I put a glass of water on the coffee table, he would sit next to it and put his paw into the glass, up to his shoulder. At this point, if I didn't notice and prevent it, the glass would tip over and I would jump up to clean up the mess. Bob would get frightened and run away. You may think, 'What a dummy....my cats know not to get up on the coffee table!' Yeah, but in this case it was a good thing, because I learned something about Bob in the process. He wants and needs to put his feet in water. I wouldn't go so far as to say that he wants to play in water, but I do know that his impulse is to 'go wading.' Once I started thinking about this, which is a slower process than I would like, I tried several variations of non-tippy water containers on the floor. The one that seemed to work the best was an old rectangular Pyrex casserole dish, with an inch of water in it, and a few slices of carrot or small pieces of lettuce in the water. Often one cat would sit next to the dish watching while another one dabbled in the water. Coming home from work I often found the dried-out vegetables on the floor as Bob and the other cats had pulled them out for investigation. Fast-forward ten years, and Bob is now about thirteen years old. He has had some interesting health issues in the meantime...allergies, a torn and repaired ligament in his knee, and recently some thyroid issues. We don't have a coffee table anymore, and he doesn't climb as much as he used to. I hadn't put out water for the cats to splash in for a while, and recently Bob and several others began moving the large water bowls around. They started to tip any of the bowls that were rounded on the bottom, and I started stepping in puddles of water around the water bowls and swearing. To prevent the puddles, I put towels under the water bowls, which led to more tipping and splashing. And swearing. In my defense, I tended to step in the puddles in the dark and barefoot, and it is startling! The towel under the water bowl wasn't really helping, so I started thinking.....again, after a delay that now seems silly. I put the most-often-spilled bowl into a pyrex casserole dish, and then realized that the bowl rocked back and forth smoothly in the casserole, pivoting on its handles. OK, I'm easily amused. Evidently so are my cats, because I could hear the bowl clanking against the casserole dish as they tipped it back and forth. This went on for some days, until I took the contraption apart to put it through the dishwasher. I haven't replaced it yet, and the bowl tipping seems to have lessened. Why were the cats tipping their water bowls? Maybe the surface tension of the still water caused it to be less appetizing than moving water. 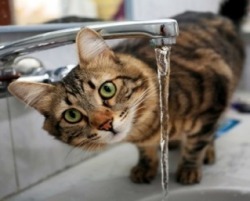 Maybe it's hard to see the waterline of still water, which seems to be another reason cats put their feet in water. Conclusions like this lead me to think of getting a drinking fountain for the cats, to see how that changes things around here. Certainly this process of paying attention to their behavior means that we will never have a dull moment, the cats and I!